Without a bathroom, a house is not a home, and an essential feature in your bathroom is the toilet. The toilet you pick for your home is a critical choice. You will be reminded of that choice every day whenever you visit that bathroom. A Reputation Hard To Beat: You must have noticed the American Standard name that pops up everywhere after visiting the bathroom all your life. That is because the American standard has over the years proven a leader in making quality washroom fixtures and fittings. These are all marvels of performance and beauty. This reputation has made their products a standard feature in three out of every five homes in America, in hotels, in stadiums, and in airports. The Best American Standard Toilet would, therefore, be a challenge for you to identify. To help address this challenge in picking one, below are ten top American Standard toilets the market has to offer. 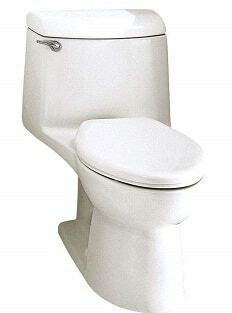 If you have a narrow, small bathroom, the 270A0001.021 Cadet-3 triangle toilet is a white angel for your bathroom. Its triangle tank is a snug fit in any corner, meaning more leg room. Despite this triangular tank fitting nicely in nooks, you cannot push it completely up against the wall. However, it has a close physique and appears as if it purposely came from the maker for your small room. This Cadet-3 triangle toilet applies for gravity assistance and uses 1.6 GPF. The tank will hold enough water to cover the standard 1.6 gallons required for flushing. An extra tank water gives you additional pressure for regular flushing. This guarantees getting rid of your droplets for keeps. Despite lacking a dual flushing system, should you need light flushing for liquid disposal, make a light push on the handle. Conversely, if you require strong flushing for solid waste, push the handle longer and harder. It will come with every necessary part to make an easy installation, other than the supply hose. Ever-care surface resists mildew and mold development with minimal effort. You are assured of powerful flushing. This product makes space savings with its triangular tank. It brings better pooping experience from a comfortable seat height. This product does not come with a toilet seat. When you are after a robust and water efficient toilet whose design brings sleekness to your bathroom, 2886.216.222 H2Option one goes to the top of the list. You get 1GPF light flushing for liquids and 1.6 GPF to flush solids from its dual-flushing system. That is 25% less water going down the flush compared to conventional 1.6 GPF toilets. Savings on water imply you have more money for what you enjoy more. A 16.5-inch height gives you comfort and eases while standing at or sitting on the bowl. This standard height is marvelous for average adults and senior citizens, giving it ADA compliance. A speed-connect system and simple installation features reduce installation time by 30%. However, should installation difficulty arise, calla local plumber? American Standard 2034.014.222 Champion-4 is a one-piece unit, its fame rests in stamping out clogged toilets through superior flushing power, performance, and abilities. It comes with a 4-inch accelerator flush valve that produces remarkable flush power in comparison to 2-inch standard flush valves. That, coupled with its 3-inch wide trap-way gives it a capacity to handle 70% more mass compared to conventional toilets in the market. You need minimal cleaning since the Ever-Clean surface prevents severe odor and bacterial growth. Coupled with being a single unit, this toilet unit makes for easy cleaning both inside and outside. Long after you have bought it, you will still love the beauty it brings to your washroom and home. When you need dependable performance in flushing toilet, consider this product. 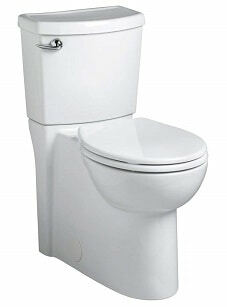 It is famous for a low water consumption rate in each flush. So is its slow closing seat and cover. 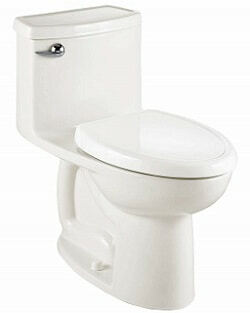 A Compact Cadet-3 toilet has a gravity design ensuring high-performance levels and lower clogs. The flush valve is big and broad allowing faster and more water bowl entry. Much as its flush is powerful, it emits little noise. As the tank is refilling, there are no gurgles or hissing, a fabulous feature for those who are noise averse. Trap-way has no choke points, furthermore, this system consists of a two-inch ball pass. These prevent clogging while giving it an ability to move a 60% bigger mass than standard 2-inch trap-ways. 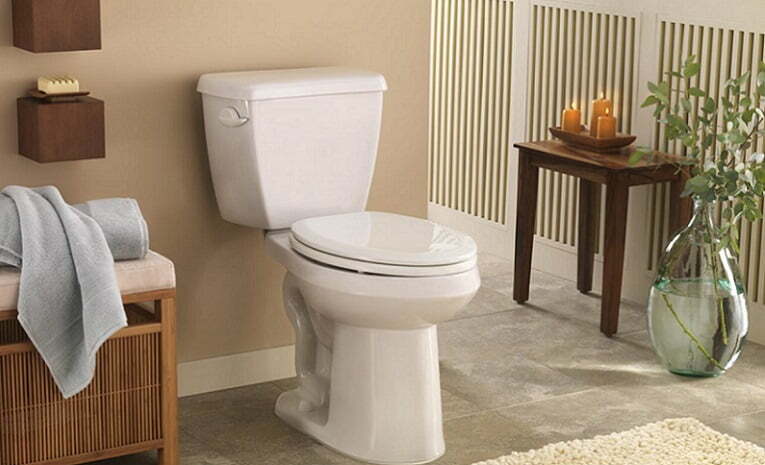 A space-saving design ensures it fits into spacing of a round-front type of toilet with ease. 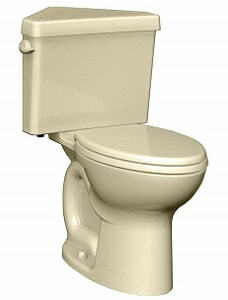 Here is the product you go for when you look to conserve water and save money with each flush. That is without compromising on your bespoke bathroom style and design. You have a choice between lime, white, and bone colors. The toilet seats fit rather snuggly while the slow close work is as advertised. Its small flush and big flush do an astounding job most of the time. Here is a quieter flusher than its comparative peers. A siphon-jet action system maintains water level throughout a flush. The enables a cleaner flush and bowl. Through a dual-flush siphon action system, this unit consumes comparatively less water in a flush than its peers. Supposing you can only spare a 30 by 49-inch floor space for your toilet, you desire a concealed trap-way design, and you have problematic knees? You would probably need a round-front toilet and a comfortable height. Also, do you need an exceptionally performing toilet that will sustain heavy usage? These are assumptions, but they create an image of what this toilet has to offer. There are no crevices and lumps around and inside it meaning you keep it shining with a quick wiping down. Toilets tend to go unappreciated and unnoticed. That is unless they fail. Not this model. 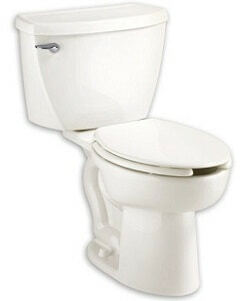 This Champion-4 model has a 4-inch flushing valve that gives 1.6 gallons of flushing. Flushes everything away and stops the need for double or triple flushes. It is also quite easy to clean and consumes relatively small amounts of water. The unit weighs 110 pounds and needs two people to set in place or carry upstairs during installation. It sets solidly without wobbling or rocking. Clogging is not an issue you will need to deal with for long periods of time, while everything comes at a reasonable price even after this long. This model is still going strong even after being in the market for so long. The unit has an exceptional flushing power. This product combines strong looks and a classic design that has roots in the 19th century Bauhaus design movement. 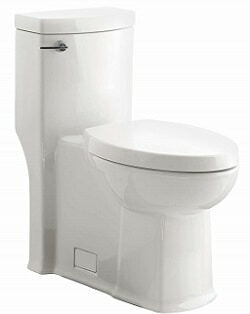 A seamless single unit toilet design has this smooth sided concealed trap-way that is easy to clean and quite fetching. 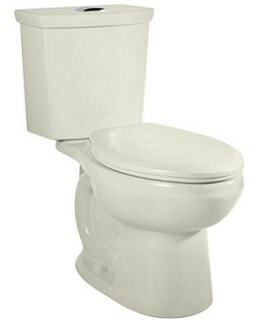 16.5 inches of right height rim height, in conjunction with an elongated bowl, lead to a toilet with exceptional comfort. A Boulevard Flo-Wise system gives 128 gallons of flow rate for each flush, effectively using less water than its peers in the market. For your designer bathroom, this product creates perfect coordination with Studio Collection among bathroom products from American Products. If you have to make several flushes in a conventional toilet for everything to go away, then this is the toilet for you Installation is a breeze although you need to buy a wax ring which does not come in the package. Designers made this toilet as a commercial product, but it looks great in those little bathrooms at the horn. You will need to get used to its sound which is just the sound of 1.6 gallons of water doing what it has to do. 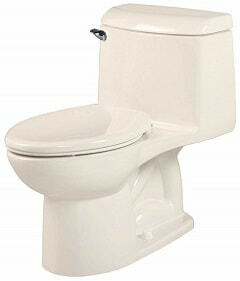 It has one of the best and most effective flushing mechanisms in the American standard group. Online reviewers say it is possible to flush persistent floaters like balloons. You will not need to worry about clogs or a plunger sitting next to your toilet again. Here is a commercial toilet made of vitreous china. It features a combination of a tank and bowl, without the seat. An excellent feature is its pressure-enhanced siphon jet flushing system. As far as dimensions go, it is 30.25 by 20.5 by 29.5 inches, space it will take in your bathroom. With several people in your house, with some who were elephants in their past lives, you will not need to use the plunger with this toilet. You will be able to install it smoothly, and it is quite friendly to your pocket. Installation comes easily with this product although using a 4-inch wax ring to connect the toilet to its floor drain hole is recommended. Surround the wax ring with some putty after connection. With the popularity and fame that goes with the American standard toilet brand, it would seem difficult to choose the best American standard toilet for your home or business. All it takes, however, is to have in mind a few factors. That is as you search from among those listed above. Consider a toilet that is going to let you save water. That way, you will help with environmental conservation while saving you money in water bills. Learn about the innovations. A constant stream of discoveries make toilets last longer, work harder, and remain cleaner than they used too. Choose one that fits the configuration of your bathroom. This way, you are assured your toilet looks right and fits your bathroom design. Toilets come in various sizes. That means you need to take careful measurements of available space before bringing your toilet home. Finally, pick the right flushing system. American standard gives you several flushing system choices. These range in functionality and pricing.